Zanzibar is a semi-autonomous archipelago off the coast of Tanzania. It is made up of Zanzibar Island, Pemba Island and many smaller islands. Stone Town is the capital of the area. It has a lot of energy and activity. It can be difficult to find affordable accommodation in Zanzibar. There are very few hostels in the area and many of the budget hotels are located in Stone Town. It's important to weigh your priorities when booking a hotel in Zanzibar. Saving money will likely mean you compromise on location and quality. 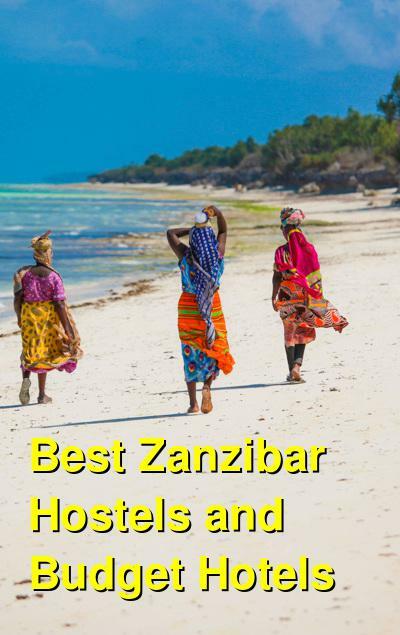 How much do hostels in Zanzibar cost? New Teddy's Place is located in the southern part of Paje, which is a small village on the east coast of Zanzibar. The village is peaceful enough to be relaxing, but active enough to have a nightlife and plenty of bars and restaurants. There are also water activities in the area that you can enjoy including kite surfing and snorkeling. The hostel is a pleasant and fun place to stay. It's near a beautiful beach with soft white sand. The hostel also offers guests some great amenities including a free breakfast that includes pancakes, eggs, and fruit. The staff is friendly and helpful and they can help you organize a variety of activities including spice tours, tours to Prison Island, dolphin tours, deep sea fishing, and more. Private rooms and dorms are available. Private rooms are either doubles or triples and have shared bathrooms. Dorms sleep up to seven people. A good option for couples and small groups. Mustapha's Place is more of a hotel than a hostel. They have private rooms and bungalows available that have a lot of character and charm. The hotel is a short walk from the beautiful blue ocean and the white sand beaches of Bwejuu Beach. This is one of the classic hotels in the area and you're sure to have a good time here. The rooms are original and fun and the hotel attracts a diverse group of guests from around the world. The ambiance is relaxed and friendly and there's a restaurant and bar on-site that many guests enjoy hanging out in. The hostel offers guests a variety of amenities including a traditional Swahili buffet and aromatherapy massages. It's a unique place to stay and is the perfect place to base yourself during your time in Zanzibar. Private rooms include doubles with and without private bathrooms, triples with shared bathrooms, quads, and six bed rooms. A good option for solo travellers, couples, families, and small groups. Ndame Beach Lodge is located on the eastern coast of Zanzibar. It's near beautiful, white sand beaches and turquise blue water. The hotel has 14 bungalows and 31 rooms that you can choose from. The area has tropical palm trees and beautiful gardens. It's a hotel that appeals to travelers of all types. Guests come from around the world. It attracts all ages of travelers and is also a nice option for families. The hotel has the Sun Sea Bar and the Blue Doors Restaurant on-site. The surrounding village also has some good bars and restaurants that are just a short walk away. There's also a popular dive school and a kite surfing school. Private rooms are available that sleep between one and five people. All rooms have private bathrooms attached. Ten to Ten Stone Town is in a great location, at the center of Zanzibar city and only 1 minute walk from the beach. All rooms are equipped with a shared bathroom with hot showers. All dorms have air conditioners and safety deposit boxes are available, and there is also free Wi-Fi for guest�s to use. There is a 24-hour front desk at the property for any questions or assistance. You can play ping-pong and darts at the guest house which also provides motor bike and car rental. The nearest airport is Kisauni Airport, 6.9 km from Ten to Ten Stone Town Zanzibar. The property has a common room where you can relax, and laundry facilities are available. Linens and towels are free with your stay. Lost & Found is at the heart of Stone Town Zanzibar, very close to the historic Shangani Post Office as well as Freddy Mercury's house. Every room at this hostel is air conditioned and comes with a TV. Certain rooms include a seating area where you can relax. There is a 24-hour front desk at the property and the hostel also offers bike hire. Lost & Found Zanzibar is 2.2 km from Zanzibar City and 47 km from Kendwa. Kiwengwa is 28 km from Lost & Found Zanzibar, while Paje is 40 km from the property. The nearest airport is Abeid Amani Karume International Airport, 7 km from the property. Airport transfer is available upon request. Wi-Fi, parking, linens, and towels are free with your stay. Drifters Backpackers, run by travelers for travelers, offers the most secure and clean refuge to travelers, kite surfers, and scuba divers on the whole island. Around the well-shaded courtyard you'll find the restaurant/bar/rooms, which can be paid either by cash or bank card. Wi-Fi is available throughout the hostel. All dorms are self-contained (with shower and toilet), have tiled-floors, and are cleaned and sprayed daily. All beds come with brand-new mattresses, mosquito nets, and linen. Also, each bed has a personal fan to fight that heat. 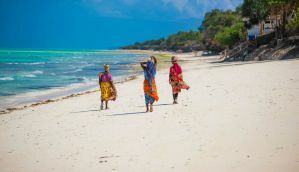 The property is conveniently located right in the heart of Paje Beach, which is the most relaxed, youthful, and water sport-oriented beach in Zanzibar. The facility also has a sea view swimming pool for guest's to enjoy, and a parking lot, security, power generator, cleaners and a chef which are all shared with their sister company Arabian Nights Resort next door. The property is less than 3 minutes' walk to bars, restaurants, kite centers, dive centers, shops, and public transport.